Man was created complete with the immune system. It is very important to fight against different types of germs from viruses, bacteria, parasites, and free radicals and toxins that threaten health. The threat always comes without us knowing, but our immune system automatically. Mushrooms contain the mineral selenium and antioxidants. It is important to meet the needs of selenium, due to low levels of selenium have been linked to an increased risk of more severe flu. Besides, mushrooms also contain B vitamins riboflavin and niacin, role in supporting a healthy immune system. Research has been done on animals show that the fungus has the effect of antiviral, antibacterial, and anti-tumor. Oysters into foods that can increase endurance, because it contains minerals zinc or zinc. Low zinc levels have been linked to male infertility. And zinc appears to have some antiviral effect, although researchers have not been able to explain it. Fruits are rich in water and refreshing, it has many powerful antioxidants, namely glutathione. This substance is known to help strengthen the immune system so it can fight infection, glutathione is found in the flesh of watermelon red and near the skin (white). Add cabbage of any varieties (white, red, Chinese) to soups and drinks so that you get extra antioxidants. Besides being able to increase the nutritional value of the food, cabbage also can increase endurance. Almonds can sustain the body's immune system. A quarter cup of almonds contains nearly 50% of the daily requirement of vitamin E, which helps increase endurance. Almonds also contain riboflavin and niacin, vitamin B is also good for the body's defense system. Oranges can be a good food because it contains flavonoids are naturally occurring chemical compounds that have been found to boost the immune system activation. The fruit is also rich in vitamin C which also can be endurance enhancer. Some researchers believe that the low-fat yogurt may stimulate the immune system to fight disease. Also a source of vitamin D. Recent studies have found an association between low vitamin D levels and an increased risk of flu and cough and cold. Garlic contains antioxidants that can fight immune system invaders. Among the targets of garlic is H. pylori, a bacterium that can cause peptic ulcers and gastric cancer. Known as a "super food" nutrient-rich spinach. Contain folic acid, which helps the body produce new cells and repair DNA. Spinach also contains fiber, antioxidants, such as vitamin C, and more so it is good for those who have a weak immune system. Green or black tea, both are good to keep the immune system, because both pick the benefits against diseases due to the content of polyphenols and flavonoids. These antioxidants are looking for free radicals that damage cells and destroy them. Such as carrots, sweet potatoes have the antioxidant beta-carotene, useful repel free radicals that damage cells. Sweet potatoes also contain vitamin A, which can slow the aging process and may reduce the risk of some types of cancer. One study reported that natural chemicals in broccoli helps stimulate the immune system in mice. 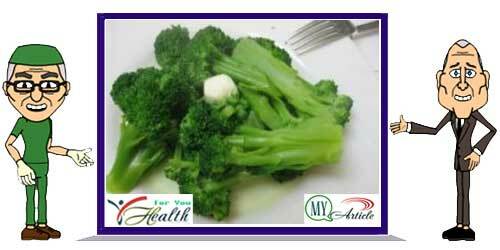 Besides broccoli also contains many nutrients that protect the body from damage. Have vitamin A, vitamin C, and glutathione.